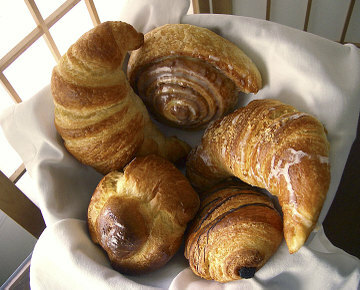 Clockwise from the top: cinnamon roll, almond filled croissant, chocolate croissant, brioche, butter croissant. Click on the photo for a larger (and even tastier) view. Ann Arbor has a number of good bakeries, but it's also got a well-kept secret: The Croissant Shop, where CIA-trained (the culinary one) baker Kurt Boyd makes delicious French pastries for restaurants, cafés, bakeries, and caterers by hand. Its existence isn't secret — what's secret is that you don't have to be a restaurant to buy from The Croissant Shop. You, too, can enjoy these gorgeous fresh pastries at great wholesale prices (that's to say, far less than what restaurants charge). It just requires a bit of advance planning. We've actually known about this for some years, since before I even started Kitchen Chick. I would order them on occasion when we had house guests, but this holiday season we decided to treat ourselves and family. The almond croissants have a sweet almond filling and are dressed with a bit of glaze and ground almonds on top, and the chocolate ones have a streak of rich dark chocolate filling. Joe loved his brioche. He dived into it as soon we got home [well, actually as soon as she was done taking pictures — Joe] because these breads are best when fresh. It was light and rich, like a good brioche should be. I really adore the cinnamon rolls. These are not the usual super-sugary, heavy rolls that sit like lead in your stomach. The dough is light and moist, the layers are filled with lots of cinnamon, the glaze delicate and delectable. These rolls really live up to the name of cinnamon rolls. I like to eat them in a deconstructionist manner — unrolling the pastry and eating each layer. The Croissant Shop also sells pecan diamonds and pecan rolls, several kinds of baguettes and breads, savory-filled croissants, and mini-croissants and mini-filled pastries. We haven't tried those yet, but we will. There is, of course, a catch: you can't just walk in and buy a couple croissants. You have to order at least 24 hours in advance (no later than 9:00am the previous day) and then you can go get your order on the morning of your pickup day. He'll need to know the specific time you plan to be by. But these treats are well worth a little planning. Pastries are best eaten the day you get them, but they'll keep for a day or so in the cardboard box, or you can try freezing them. Storing them in a tupperware will make the flaky crisp outsides go soft, but a few minutes in a toaster oven can help with that. Hi KC - happy new year to you. that almond croissant has my name on it i think...but please remind me (i left A squared in 93) where is plaza drive? is that north campus? have a happy and safe new years with the people you love! Brooklynguy: actually, it's out by the Ann Arbor Airport in this maze-like complex of beige and brown light industrial buildings that include everything from The Croissant Shop and Zingerman's Bakehouse (did that exist in '93?) to a martial arts school and some church that rents space. Best wishes for a great 2007! Try the Pecan Diamonds. They are to die for! Best wishes to the Boyd family. Kurt your cinnamon rolls rock. Happy New Year in 2010.